1.2 What are the main types of avocados? 1.3 Which avocados are there in the market? What are the main types of avocados? – Mexican avocado or Creole avocado (Persea americana var drymifolia. ): Small fruits and large seeds, but the flesh is very rich in oil (up 30%). The skin is not as thick as the other varieties. It is one of the most resistant cultivars, being drought tolerant and resistant to frost down to -6 ° C.
It can grow to more than 2,000 m. altitude. It does not tolerate salinity. Cotyledons or first leaves when the seed germinates, are smooth or slightly rough. The leaves and fruit have an aniseed aroma. – West Indian avocado (Persea americana var. americana): Large fruit, thin skin and soft pulp, with a slightly bitter aftertaste. It contains up to 20% oil. This variety does not tolerate cold and should grow to a maximum of 1,000m. altitude. When the seed germinates, the first leaves are very rough. The fruits fall from the tree because its petiole is thinner than other varieties. – Guatemalan avocado (Persea americana var guatemalensis. ): Very thick and rough skin, small seed. The fruits are harvested in winter (“winter avocados”). They contain between 20 and 26% fat. This variety tolerates salinity and it is more resistant to cold than the West Indian variety (although not as much as the Mexican varieties). It can be grown to 2,000 m. altitude. When germinating, the first leaves (cotyledons) are smooth. The buds of the plant are reddish. Which avocados are there in the market? – Hass (Mexican x Guatemalan): One of the most consumed and traded varieties. Medium fruit, oval, very dark, crumbly skin. Its pulp contains 20% fat and small seed. Small or medium size. It does not tolerate wind, nor very dry or hot weather. It is usually associated with the Bacon variety to pollinate the avocado flowers. – Bacon (Mexican x Guatemalan): Fruits as “eggs” or oval, with dark green, thin skin. Yellowish tasty pulp. Large, erect, vigorous trees. Resistant to cold. – Strong (Mexican x Guatemalan): Very common variety. Medium fruit, pear shaped, with almost smooth, soft skin dark green with yellow dots. Yellow pulp, tasty color. Fruits are pear-shaped and of medium size. – Mexicola (Mexican variety): peculiar variety. The fruits have a thin, dark purple, almost black skin. It is one of the most drought and cold -resistant varieties. – Duke (Mexican variety): Small, elongated pear shaped fruits. Pulp is smooth, tasty and contains 18% fat. – Edranol (Guatemalan variety): Fruits of small or medium size, pear-shaped, rough and dark green skin. The abundant pulp (the seed is medium), with a fat content of 17%. – Hazzard (Guatemalan variety): Variety with high fat (up to 34%). The skin is very thin, virtually with no roughness, the pulp is pale yellow, very soft and oily. – Reed (Guatemalan variety): Fruit large, round, pulpy, witn medium seed. Much appreciated. 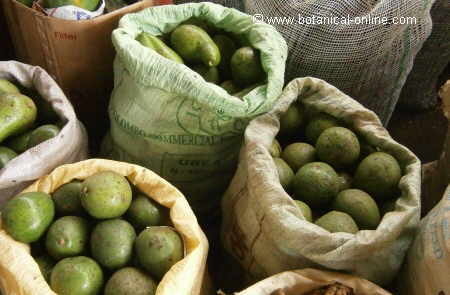 – Booth (Antillean x Guatemalan): Round or oval fruit (there are different kinds), skin smooth and slightly rough. It is a very productive variety.